freshwater will be in ever shorter supply as climate change gathers pace. A new study indicates that increasing temperatures will dramatically impact the world's major rivers. While flows will increase overall, with some rivers becoming more swollen than others, waterbodies that cater to the majority of the world's population will dry up. Veteran climate modeller Syukuro Manabe and his colleagues from the us-based Princeton University simulated what effect a quadrupling of carbon dioxide concentration (from the pre-industrial levels) would have on the hydrological cycle over the next 300 years. They found that both evaporation and precipitation would increase. Evaporation will reduce the moisture content of soils in many semi-arid regions, including northeast China, the grasslands of Africa, the Mediterranean, and the southern and western coasts of Australia. With an increase in precipitation, the overall discharge of freshwater from rivers worldwide will rise by almost 15 per cent. The biggest increases will be in the thinly populated tropics and the far north of Canada and Russia. For instance, the flow of the river Ob in Siberia is projected to increase by 42 per cent by the end of the 23rd century. But there will be less flow in many mid-latitude rivers, which cater to the heavily populated regions. These include the Nile, Mississippi and Mekong (Climate Change, Vol 64, No 1-2, May 2004). Such changes will present a "profound challenge" to the world's water managers, asserts Manabe. But many experts find his findings unrealistic, as they are contrary to the well-established impacts of climate change. 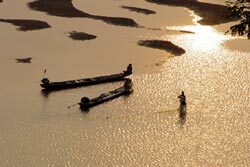 For instance, Manabe foresees a 49 per cent increase in the flow of the Ganges and Brahmaputra, but many studies have reported that these rivers would lose flow as the glaciers that feed them melt. While the controversy continues, another research indicates that the climate change has already increased flow of rivers in Asia and North and South America. Run-off in Europe has remained stable. But in Africa, flow of many rivers has declined significantly (Advances in Water Resources, Vol 27, No 6, June 2004). As per researchers from France-based Centre National de la Recherche Scientifique, changing temperatures will cause river flows to rise and fall after every 15 years.